Looking at it today it may be hard to believe that once upon a time this 1934 Ford was an award winning car. Time hasn’t been kind to it, but with a solid base there is the opportunity to return this Ford to its former glory. You will find it listed for sale here on eBay. Located in Wildomar, California, it comes with a clear title. Initially listed with an opening bid of $5,000 bidding has now pushed that price to $11,600 but the reserve hasn’t been met. This car was originally built in the 1970s, and as you can see it was a really stunning looking car. 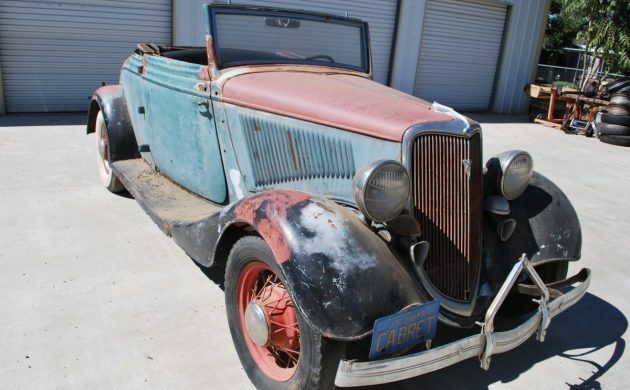 It was owned by the President of the 33/34 Ford Hot Rod Club of California. The car was then purchased from his estate and spent its life between southern California and Mexico. About 30 years ago it came to be parked in a field in Hemet, California, where it sat until recently. There is going to be some work ahead for the new owner of this Ford to bring it back to life. The elements have been relatively kind to the car and there are no major rust issues to report. There is rust in the floors and in the lower rockers, but any remaining corrosion is only surface corrosion and should be relatively easy to address. It is worth noting that there are no reproduction panels on this car. Everything that you see is stock Ford. The seller also states that the personalised blue and yellow “CABRET” plates will go with the car. 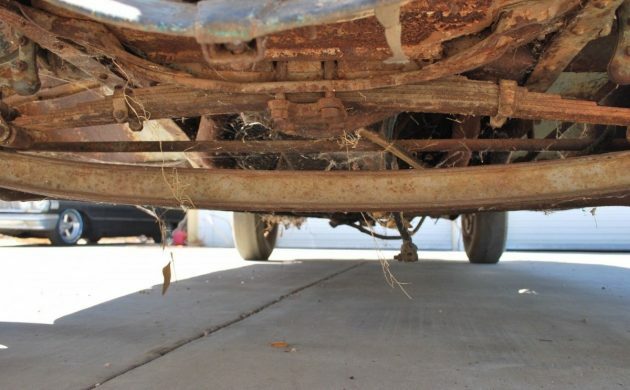 Under the car still retains the cobwebs that have accumulated over the 30 years of field life. Once again there’s definitely corrosion under here, but I feel that this could also be addressed. 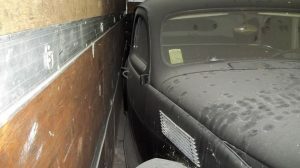 The temptation would certainly be there to do a full body-off restoration to ensure that everything is absolutely spot on with the car before it hits the road. This is probably the worst piece of news about this particular car. The head and inlet manifold are both long gone. That in itself is not earth shattering, but open exposure for 30 years will certainly have had a major impact on the engine. 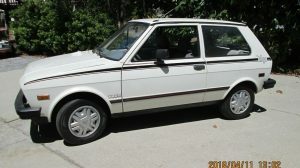 The seller makes no indication as to whether the engine is locked, but it wouldn’t be particularly surprising if it is. The rest of the drive-train is standard 1934 Ford. The car also doesn’t have working brakes, so you will be looking at a complete mechanical rebuild or a drive-train replacement to get the car up and running. 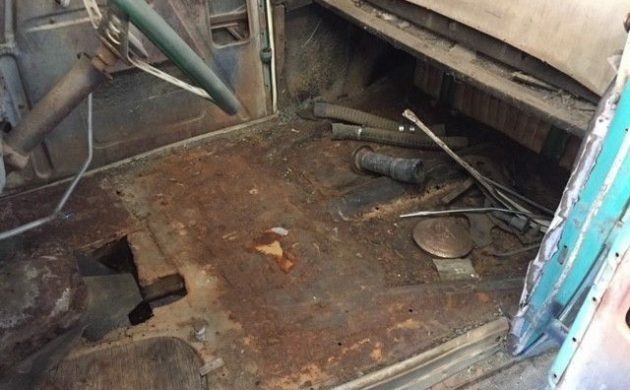 The interior will also need some work, but thankfully that has been started by the current owner. When the car was retrieved from the field the only item that was deemed to be beyond repair was the seat springs. 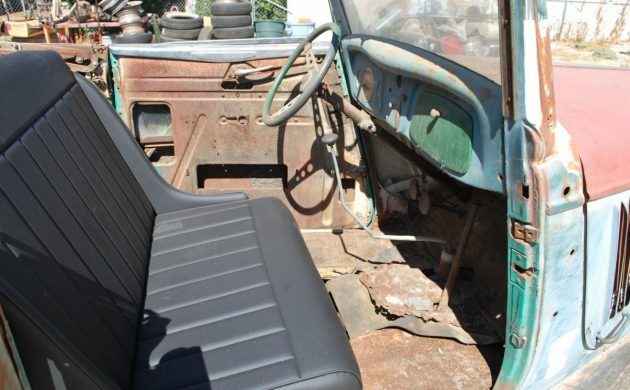 The seller has had a new custom seat made for the car, so that will give the new owner a great starting point for a complete restoration. 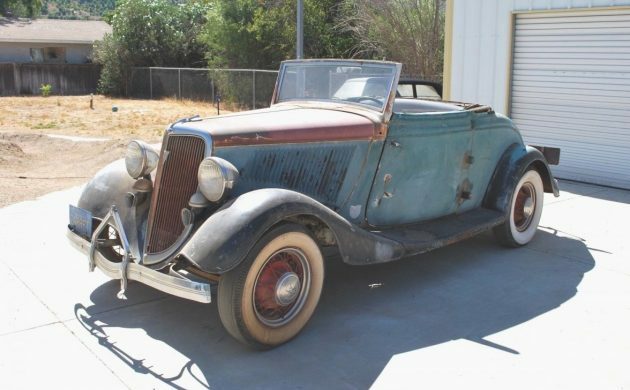 The rumble seat is still present, but once again it will require a full restoration. There is no doubt that this car represents a fairly major restoration job. To return this Ford to its former glory is going to take a lot of time, and not a little bit of money. Personally I don’t know if this project makes economic sense, but it would be nice to see this award winning car returned to its former glory. 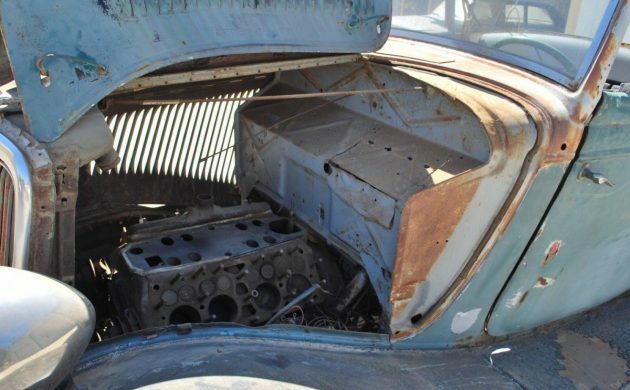 It represents a part of California’s hot rod history. I’m always dumb founded when I see a car like this, particularly an award winner, left in a field for 30 years. At least it was in California and not the north east. It still looks like an award winning car to me. I love it. Gorgeous! I gree why would someone let it back slide into decay again. My short answer is it fell into the wrong hands, not everyone is a gear head with an an appreciation for historical cars. Had it been someone else it my still look like a show car. It goes to show you that nothing lasts forever, we humans don’t so why should the cars. As for the car itself it looks like it’s got good bone still so maybe it will make a come back but likely in a differant form and that would be ok by me too. I would tend to agree. How often do folks replace the original wire wheels? The old picture 34 looks like it has a vette or jag rearend, so I concur. Still a nice start. I agree. There is no way the car in the photo is the same car that is for sale. 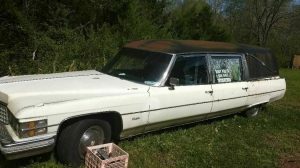 There is a whole lot different from the magazine car pictured and the one for sale. I too call shenanigans. Multiple things do not add up, like why would someone put the horns and original wheels back on, front bumper guard, etc. Totally different car but damn I like it just as is! Beyond it’s current shape, the car in the ad is better than the show car with the knock kneed rear wheels and lowering kit. It just looks stupid and dangerous set up that way. There’s not much to go on but, I’ll be the first to say it…. It doesn’t look like the same car as the show winner to me. If you knew how hard it is to install that original grill emblem… You’d think the same thing too. Some of those dash plaques look like they have 1980s dates on them. 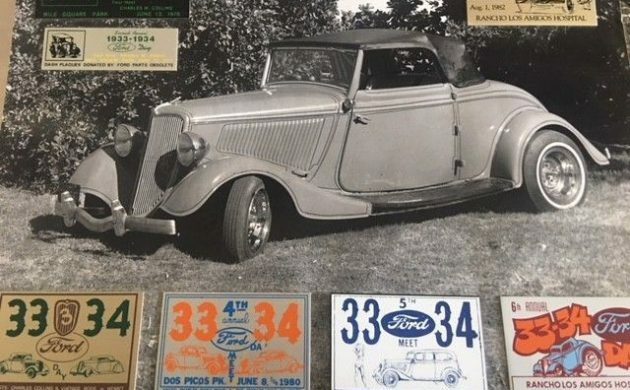 That was a time when ’33-34 Fords were hot and very sought after. Who would have taken a show winner into a field and left it? When I find one thing in an advertisement fishy, everything else is suspect. That seat looks like the most uncomfortable place to rest your bottom imaginable…and this is where they STARTED the restoration? Why not the motor? 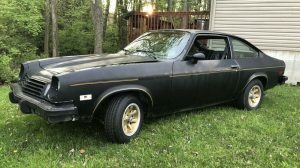 “Seller makes no indication as to whether engine is locked….” with no manifold and heads to keep water out, that motor was locked the first week it sat out. California wants to regulate everything, they should make leaving a car like this in a field a life sentence offense. I’m kind of surprised at all the concern about if it’s the earlier pictured car. It’s sorta like the irrelevance of “ran when parked”. Might as well say, “Looked great the first day it rolled off the showroom floor.” . The only thing that matters today is what it is today, unless there’s significant, documented history that someone is willing to pay for………same or not, this doesn’t have that IMO. Seller loses credibility again, engine is not the “original”, it’s a ’37/8, and ’36 didn’t have wire wheels, those are ’35 for the 16s. He does have a somewhat better, more thorough description than many, but undermines himself with knowledgeable buyers. If bidding follows recent trends it doesn’t look like he’ll clear $20k, though I’ll bet his reserve is higher than that. One last comment. That seat looks cheap and awful, no curvature on the back cushion for even minimal lumbar support. My experience with seats of this appearance is the foam used is not the proper high density type either. If there’s enough material around the edges this maybe could be rebuilt to a usable seat (for any kind of real driving more than a couple miles), but it will end up costing as much to rework as it would have to do a proper seat to start with. More fools gold……………. BTW he’s also got a Model A coupe offered with a similar story. I thought the seat looked like an aftermarket fiberglass frame covered with vinyl when I saw it. Oddly modern looking, but….. This is a hot rod builder? Not one I want to associate with…who puts up another car to show what this one used to look like. His words: “at the end of the day I build custom cars and I just can’t bring myself to cut into this one or fool with it more than I have.” Doesn’t look like it was fooled with at all, except for that goofy black pleather thing he’s calling a front seat!!! I’m surprised members of the 33-34 club haven’t called BS on this fella and asked him to pull down the listing. Another thing about the picture with the show plaques, my sister and brother in-law bought a house in VT years ago with a barn/garage on the property. Neither of them are car people, so when I walked in the structure, the wall was covered with car show plaques from the old owner. They offered to let me take them all down and keep them, but they were all glued to the boards so most would get ruined. I’m a bit skeptical as to whether it was a show car or not; I’m leaning toward the NOT. Otherwise I like everything I see, and would love to see it come to my place, but that will likely be a pipe dream. Someone stuck a ’37 engine in there; easy to recognize with the 21 stud, center outlets and 18 mm plugs. I’d likely drop in my spare ’35 engine and call it good…. So , some dirty rat not only painted the mudguards black but they also stole the pinstripes, some people, really! And un dropped the axle. Highly suspect indeed. However, if just considering the car as it sits today, sans the story and questionable accolades, it looks to be a good foundation for a mid 30s Ford. Not my cup of tea to be sure but an iconic design none the less. I think The Who said it best in 1971, “We Won’t Get Fooled Again” or in this case, “We Won’t Get Forded Again”. I contacted the seller. No further photos of the car when it was participating in shows a mere thirty years ago. So, this and the Model A came from the same source. An eccentric hot rodder gone mad. I believe this seller, being in the business, should know when the photo that came with the car just happens to be another 33-34. Notice it does NOT have the silly CABRET license tag on the back. In fact, no tag holder at all on the show car. Still, plenty of active bidders…this car will find a new home. Uhm. It’s an eBay listing. There is a button to the right of the sale price that says “contact seller.” Simple as that. He/she responded right away. You do know how to communicate within the eBay portal, right? You can also do it through Craigslist postings as well. Sorry if I’m sounding brash….Why haven’t you gone to look, DAVID6? Just a new spin on the old game, As, there is no way to prove it is the same car, and, who really cares? I am sure the seller picked it up for next to nothing, it’s called a “”quick flip” out here in the west. It’s the new “in” thing. Again, I am with Uncle Bob, what difference does it make, if it is the car in the picture, or not. It is a 34 Ford Cab, and is a very desirable Model 40. That being said it is not going to be cheap to build, no matter what you want to do with it or whatever history it has. Don’t even want to address, all the comments that it has to be restored , can’t have a SBC, or be a Hot Rod. The thing is, it is just a math problem and what numbers make sense to the buyer. The good news it looks like most of the important parts are there , bad news they all need work. Good luck to the buyer, no matter what his plans, for the build are. Still Looks Beautiful too Me!! It’s supposed to be the founder of the Over the Hill Gangs ’34, except Tom Sterkel CLUB FOUNDER owned a ’34 Ford Pickup, which the family still has.